Our 17 week old GSD is extremely protective of our family. Whenever anyone approaches us she growls. We have placed her in puppy kindergarten and we take her out with us as often as possible to help socialize her. Is this normal behavior for a GSD? Total German Shepherd: This can be an issue with any dog - not just GSDs - but I'm glad to hear that you've got your German Shepherd puppy in a puppy class and that you're socializing her. Keep that up. Obedience training is the best way to handle these issues. 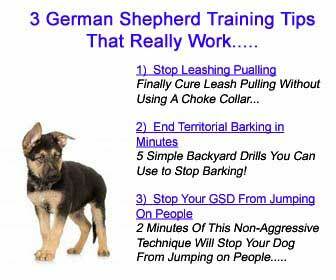 Also I would suggest that you discuss this with your trainer and see what kinds of additional training he/she might suggest you do with your German Shepherd puppy to make it feel more comfortable and relaxed - and you too, because oftentimes your emotions can be transferred right down the leash to your dog. And by that I mean if you're nervous or anxious when meeting new people with your German Shepherd puppy or dog (maybe because that you're worried about how the puppy is going to react, or over-react) that the dog can pick up on your signals and become more agitated, more nervous, or maybe more fussy because your German Shepherd senses that you have changed emotionally which can cause your dog to do the same. But definitely discuss your issues and concerns with your trainer, continue to socialize the German Shepherd puppy all the time, follow through with all the training you can handle and more and you'll be rewarded with a happier relationship with your GSD. And a better behaved GSD too. Good luck! 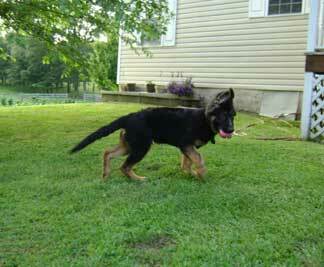 Comments for Is my German Shepherd protective or too aggressive? I'm quite familiar with the behaviour you are describing and I can assure you with continual training and ongoing hard work you will be able to modify your puppy's behaviour. This will not happen overnight. I would also recommend seeking professional help. They will be able to work with your puppy and you. My german shepherd recently turned one and he has made amazing progress. Our hard work doesn't stop here. It's an ongoing adventure for both of us. The rewards are huge with each milestone we reach. Good luck and keep us updated on your progress.